What is the Dexter Paint Out? 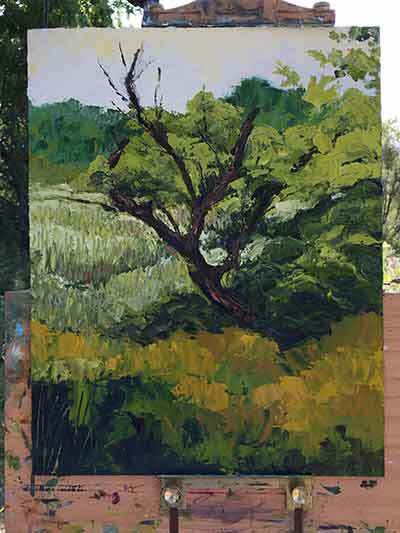 The Dexter Arts, Culture & Heritage Committee held its 5th Annual Paint Dexter Plein Air Festival. 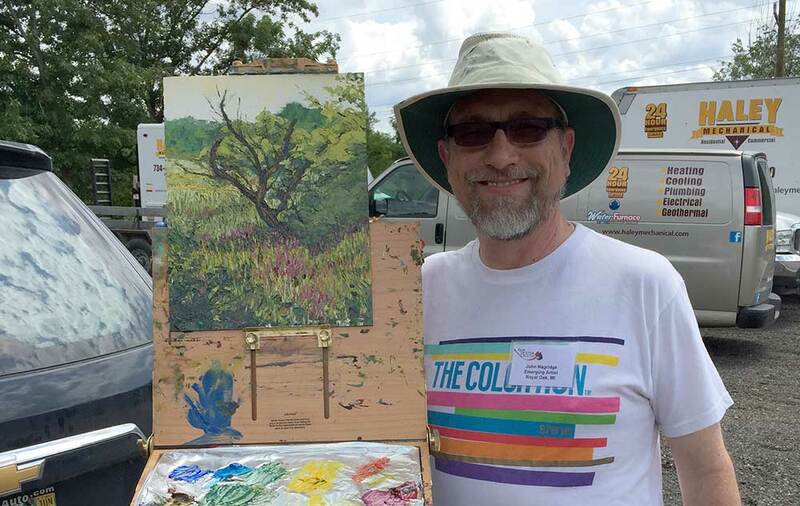 Artists from all around the Midwest come to Dexter to paint plein air works within the borders of the Dexter School District. You register as either a Professional Artist (which entails getting juried in based on your past art experience, or as an Emerging Artist (which is not juried). Since I’ve never participated in a Paint Out before, I entered as an Emerging Artist. It was one of the most unforgettable weeks of my life. Let me tell you all about it. 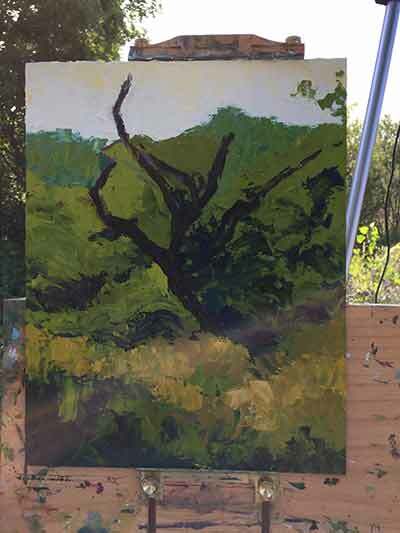 This gnarled tree surrounded by magenta wildflowers became my first subject for the Dexter Plein Air Paint Out. I got up extra early to get to the city of Dexter, Michigan. My car is packed with clothes for a week, my EasyL Pro and umbrella from Artwork Essentials, oil paints, panel boards, my trusty painting knives, and anything I can think that I’ll need to turn out as many plein air paintings in the time allotted. Friday morning, I have to turn in no more than 3 submissions, plus 2 reserve paintings, framed, wired, and ready to hang and sell. I’m not allowed to start or paint any of them ahead of time. When I arrive around 7:45 am, I go to Monument Park where I meet Victoria Schon, the organizer of the event. She and her assistants stamp the backs of my panels with the name of the event and the date. I can get as many stamped as I like, but these are the only panels I can use to paint on to submit for the event. I probably got 13 stamped, knowing that would be more than enough. Now I’m free to paint through Thursday. But where do I start? I don’t know the town at all. Happily, they gave all the artists a packet containing the rules of the event, as well as a list of private homes and businesses that welcome painters. I scoured through it and came across Haley Mechanical. When I showed up to confirm it was okay, they were thrilled to let me paint on their grounds. Behind their building was a field filled with beautiful wildflowers. 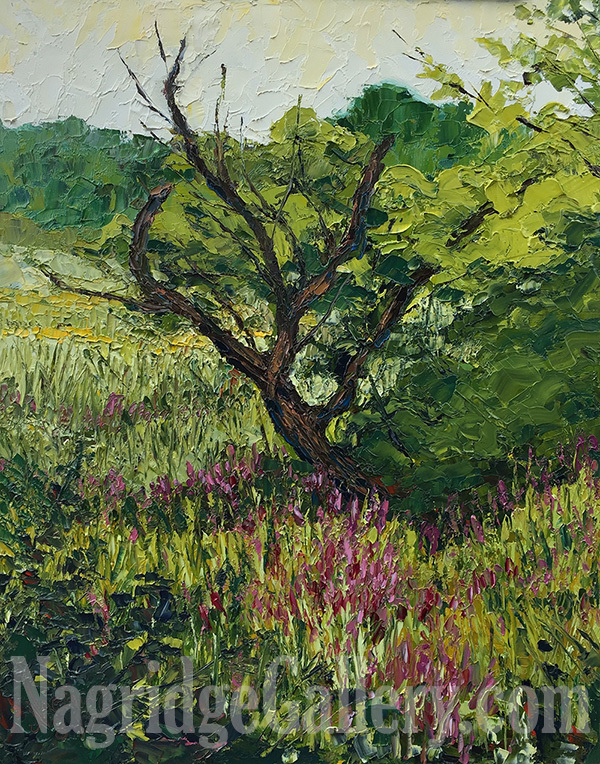 I came across a gnarled tree in a meadow surrounded by magenta wildflowers and chose it for my first painting. This is the moment I’ve waited for for weeks. I’ve been rather nervous the past couple weeks about this paint out. I know a few of the other artists who are also participating and they’re incredible talented. Time to set that aside. Looking at the subject, I draw my composition on my panel with an acrylic paint marker. Once I’m happy with my rough sketch, I mix some titanium white, cadmium yellow light, and a touch of ultramarine blue and scoop it up with a knife. Here goes. I start scraping the paint into the sky area of my first painting. Soon, the right side of my brain takes over and I no longer think about where I am, what time it is, or what obligations I need to meet. I’m in painting mode. I want to fill the panel with blocked in color first. It becomes fun very quickly. I spend a lot of the time with the sky. I wanted it to capture the hot summer morning, so I made it a pale hazy yellow gradating lighter toward the horizon. Then, I started working on the blocked in areas, Increasing contrast, playing with color temperature, and working with the forms. I’m not worried about realism yet. I read somewhere that all plein air paintings are usually ugly until the last 10 minutes when the details are worked out. That sounds about right to me. I forgot how long it took to finish. I’m guessing about 2 1/2 to 2 hours. Below is the finished piece. I was pretty happy with it. 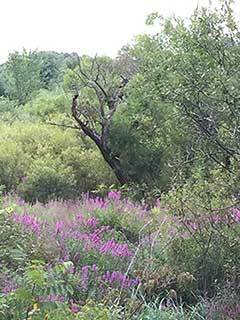 I liked that, even though I painted bright magenta wildflowers, I was still able to keep the trunk of the main tree the focal point. After grabbing a lunch downtown, I drove around the town of Dexter to scout out future locations. There’s lots of great places to paint, including a train depot, a couple nice churches, a cute downtown with a big clock, a creek surrounded by a boardwalk and marsh grasses and on and on. Outside the downtown area are lots of farms, barns, and beautiful houses. With all that beauty, I somehow decide to focus in on a cracking concrete wall with weeds, bushes, and trees growing all over it next to an old DTE building. Below, you can see the finished painting with my set up. 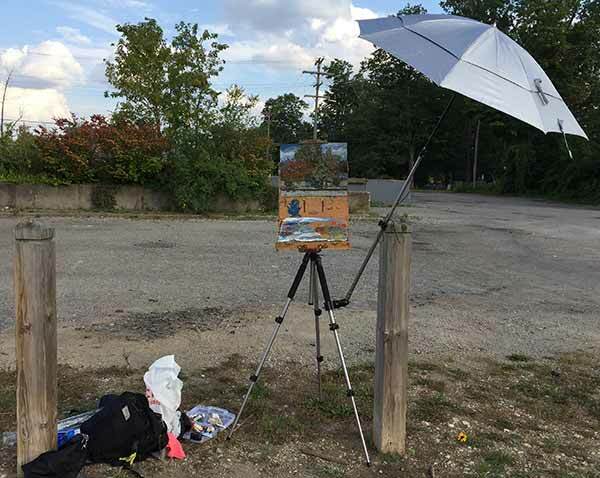 My plein air set up consists of an EasyL Pro poached box affixed to a tripod. Attached to it as an artists’ umbrella. It’s not keep the artist in the shade. It’s for the painting and the palette. 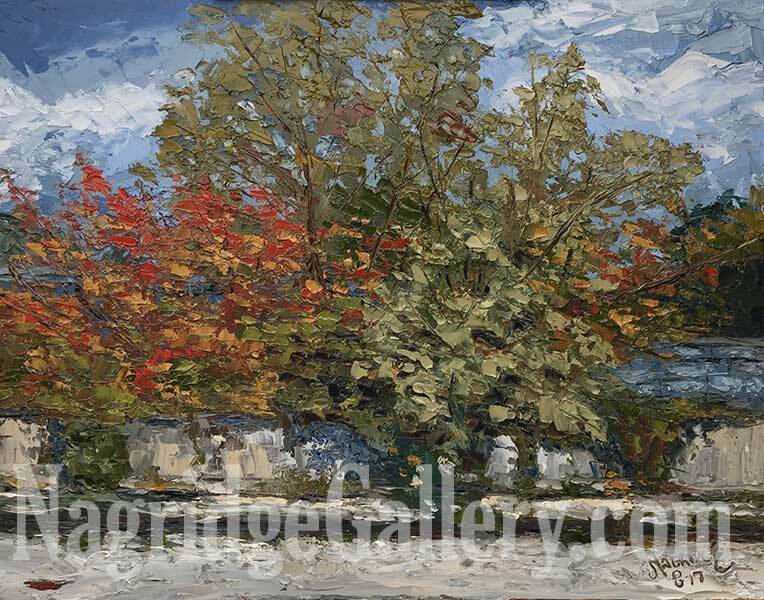 You never want sun shining on your painting or your palette because it distorts the color. If the sun shines on it, an artist may compensate by darkening the colors. But later, when the artist hangs the work, the paint looks too dark because the lights inside aren’t as strong as sunlight. If I keep the painting in the shade when I work, the opposite happens. I may compensate for the darkness by brightening the colors slightly and that makes for a more pleasing final work. 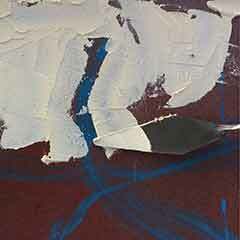 Below is a closeup of the finished painting. The sun was setting and my stomach was growling. Two paintings in one day and I don’t hate either one. I’m off to a great start! I celebrated with a swim in my hotel pool after a good meal. Then I studied the list of potential location in my hotel room and went to sleep. A kind of painting I never attempted before!